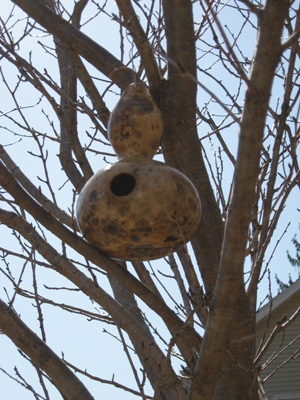 The gourd birdhouses were hung in place today, and a red-tailed hawk was laid to rest in my garden. It was a day to set out, to rearrange, and to appreciate beginnings and endings. My son and I noticed the red-tailed hawk in our neighbor’s backyard. The neighbors are away for a bit, and the bird was so large, and so beautiful, that I couldn’t bear to leave it untended. We moved it into our yard, and I decided that burying it in our newest flower bed, and planting flowers there, would make a fitting resting place. A beautiful and regal bird. 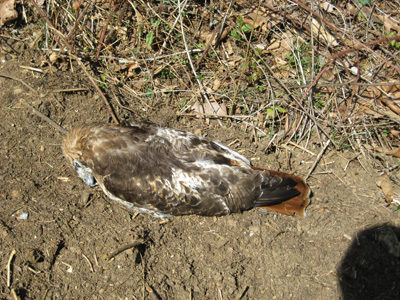 I did wonder why I felt the need to bury this bird, when other dead animals are not treated with the same consideration. Mice, chipmunks, sparrows, insects — I would never think about burying them. I’d toss them away, out of reach of the dog, perhaps up on the hillside to go back to the earth, and feel that I had done the appropriate thing. Was it because the hawk was so large? Was it because the hawk was a predator, and so I felt it was more worthy of care? I only know that I wanted to place it properly, and this did feel right. I have ordered Cosmos seeds for the spring, and will plant those lovely annuals in the bed, thinking of that hawk when the pink, red and white blossoms appear. The bird is properly in place now. 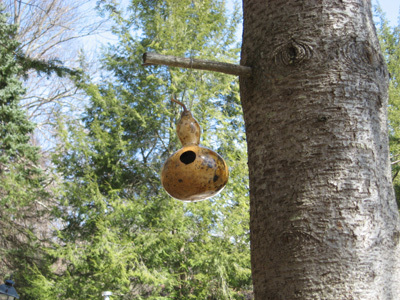 My daughter helped me place our gourd birdhouses in the trees. I dragged the stepladder out of Husband’s workshop, but my daughter has grown more than I realized, and we only needed the ladder once! 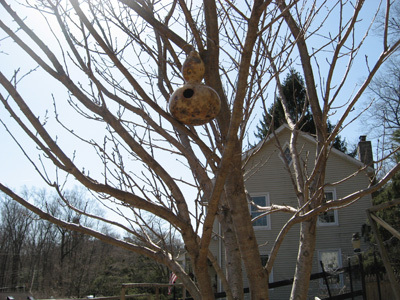 For the first two birdhouses, she simply reached up and put them in place. This will be visible from our living room window. Daughter and I agreed that we should twist the wire, to minimize the birdhouse from swinging too much in the breeze. The wire was soft enough to easily twist and pinch together. 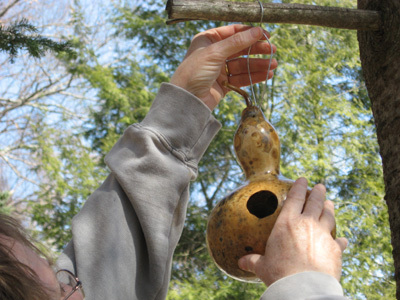 The second birdhouse was a “Speckled Swan” gourd, with a very long neck. We would need a tall branch, indeed. High up on the hillside, we can see it from the back patio and from the kitchen window. 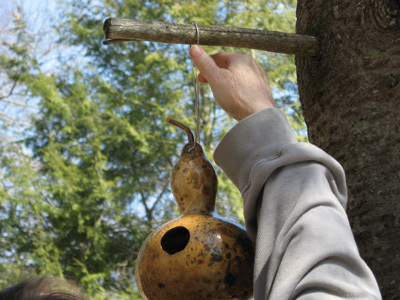 The birdhouse rests its back and sides against the trunk and branch, making it quite stable. Placed high in the tree, it waits for a tenant to make a place for her babies. The hawk is at rest. 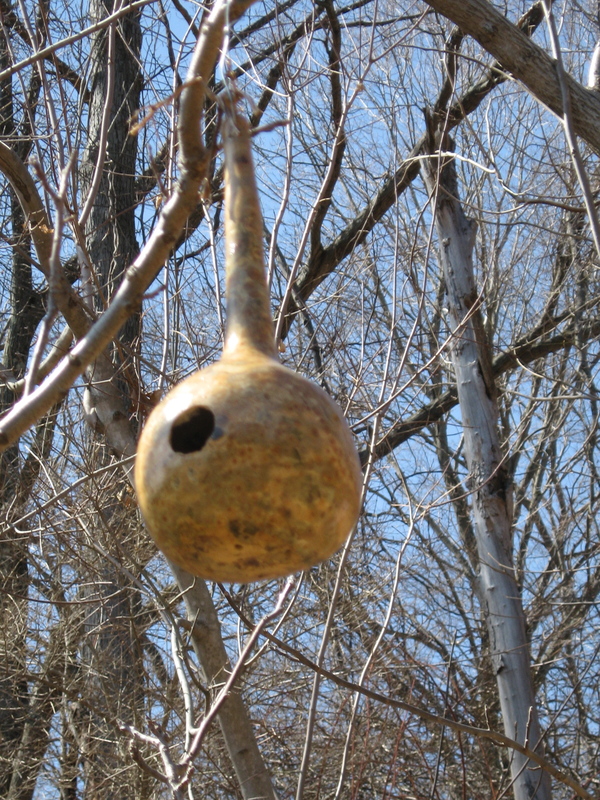 The birdhouses await. It was a good day, and I am content with how I spent it, moving things about, setting everything in its place. — 1842 Marryat Masterman Ready II. i. –1855 T. C. Haliburton Nature & Human Nature I. vi. — 1928 D. L. Sayers Lord Peter views Body x.